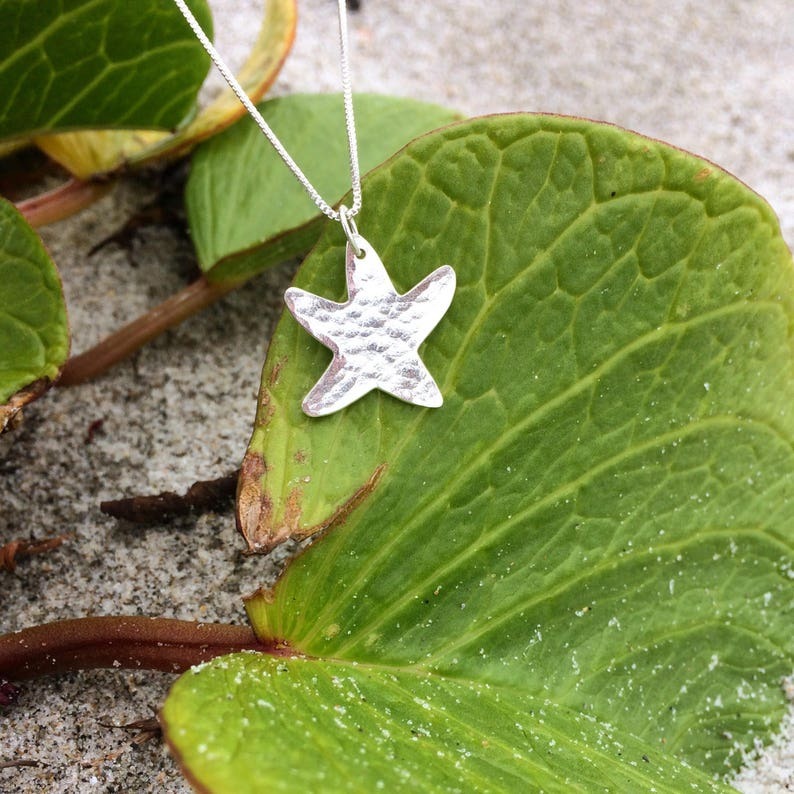 This sweet Starfish necklace is hand-made with beautiful sterling silver! Inspired by the texture of real starfish, I carefully hammered the silver to create texture and shine. On a Sterling Silver necklace chain, this is a fabulous accessory for a day at the beach with the wind in your hair! For a beach wedding, this is the perfect piece of jewelry! Your necklace will arrive in a gift bag, along with a polishing cloth to clean your silver jewelry with. I love Betsy Murray and her beautiful creations. She is responsive and always so positive. I appreciate being able to buy products from her. The necklace is perfect. Well made! Fast shipping and excellent communication. Thank you. Refunds are available for certain items. Rather than leaving negative feedback, if you are not 100% happy please contact me within one week of receiving your purchase and you will receive a refund. Refunds are not available for earrings, I cannot resell them. I stand behind my art and jewelry but if there is an issue please contact me prior to leaving negative feedback. Positive feedback is always appreciated!! *I ship First Class USPS mail. Once your item has been shipped, I will send you an email notice within 24 hours. Please be sure your shipping address is up to date with Paypal. *For All INTERNATIONAL orders, PLEASE note I ship USPS... I am NOT responsible for ANY Customs Tax that may be charged once your package arrives in your country. CUSTOMS tax is out of my and the US postal control. *Please allow 10-14 days for all items shipped to Canada. *If you would like your purchase shipped to an address other than that listed on your Paypal/Etsy account please contact me within 24 hours of your purchase. Custom orders for those in the United States are available. Please anticipate that a custom order takes about 1 week for me to make, plus time for shipping. If you are interested in a custom order please contact me.